Today, we’re introducing Google Drive—a place where you can create, share, collaborate, and keep all of your work. Whether you’re drawing up floor plans with a client, creating a presentation with classmates or planning next year’s budget with colleagues, Drive makes it easy to work together. You can upload and access all of your files, including videos, photos, Google Docs, PDFs and beyond. Create and collaborate. Google Docs is built right into Google Drive, so you can work with others in real time on documents, spreadsheets and presentations. Once you choose to share content with others, you can add and reply to comments on anything (PDF, image, video file, etc.) and receive notifications when other people comment on shared items. As a business user, you can share files or folders with specific people, your entire team, or even customers and partners outside your company, controlling who can view or make edits. Search everything. Search by keyword and filter by file type, owner, activity and many more. Drive can even recognize text in scanned documents using Optical Character Recognition (OCR) technology. Let’s say you upload a scanned image of an old newspaper clipping. You can search for a word from the text of the actual news article. 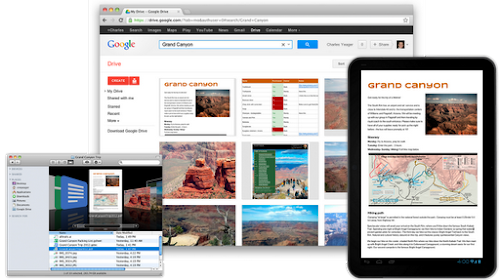 We also use image recognition so that if you drag and drop photos of the Grand Canyon into Drive for an upcoming ad campaign, you can later search for [grand canyon] and photos of its gorges should pop up. This technology is still in its early stages, and we expect it to get better over time. Open more than 30 file types right in your browser—including HD video, Adobe Illustrator and Adobe Photoshop—even if you don’t have the corresponding program installed on your computer. Centralized management: New tools available in the Apps control panel for administrators to add or remove storage for individuals or teams of users. Security: Encryption on data transfer between your browser and our servers, and optional 2-step verification that prevents unauthorized account access by having users sign in with a secure code from their mobile phone. Data Replication: Simultaneous data replication in multiple data centers, so that in the unlikely event that one data center is unavailable, your files will still be safe and accessible. Uptime: 99.9% uptime guarantee so you can be confident that your files will be available whenever you need them. Support: 24/7 support for assistance when you need it. Starting today, Google Apps administrators will see new controls for Drive in the control panel. Users at organizations on the Rapid Release track will be able to opt-in to Drive at drive.google.com/start. Drive is built to work seamlessly with your overall Google experience. Drive is also an open platform, so we’re working with many third-party developers so you can do things sign documents with DocuSign and HelloFax, design flowcharts with Lucidchart and manage projects and tasks with Smartsheet directly from Drive. To install these apps, visit the Chrome Web Store—and look out for even more useful apps in the future. This is just the beginning for Google Drive; there’s a lot more to come. Contact our sales team or a Google Apps reseller if you are interested in signing up for Google Apps and Drive. Note: At launch it is not possible for organizations using Google Apps for Education or Google Apps for Government to centrally purchase and manage additional storage.